The talks will take place next week, with a ceasefire as the main topic of discussion. May 5 (teleSUR) The Colombian government and the National Liberation Army have announced Havana, Cuba as the location for their next round of talks. The decision was announced via a statement issued early Saturday. The negotiations will take place next week, with a ceasefire as the main topic of discussion, the statement added. “After jointly examining the options to restart talks as soon as possible, we have decided to continue the fifth cycle of talks in the city of Havana, Cuba, beginning next week,” the two sides said in a joint statement. The two sides’ first-ever ceasefire ended in Januaryand was followed by a period of increased violence and a six-week suspension. In March, the government and ELN announced that they were discussing the possibility of agreeing on a new bilateral ceasefire. However, Ecuadorean President Lenín Moreno announced in mid-April that his country would no longer serve as the guarantor and host for the peace talks between the two parties. Speaking to members of the media Moreno said: “I have asked the foreign minister of Ecuador to stop talks and our status as guarantor, while the ELN does not commit to leaving terrorist activities. “Ecuador’s decision came after two Ecuadorean journalists and their driver were killed by an armed group of dissidents. 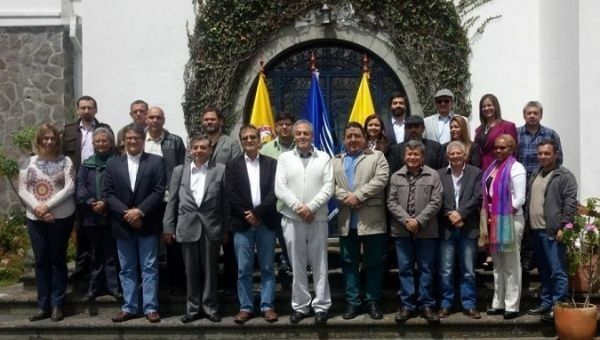 In response to the comment, ELN chief negotiator Pablo Beltran told teleSUR English that the ELN was looking forward to continuing the peace dialogues. “We have decided to continue the peace dialogues in whichever country that we choose,” Beltran said. “We hope that in the time remaining in negotiations we can arrive at a new truce that must be better than the last one… Colombia can count on us that we will maintain the effort to find a political solution. “Brazil, Chile, Cuba, Norway, and Venezuela are the five remaining guarantor countries for the ELN negotiations. Colombia’s protracted conflict between the government, rebel groups, paramilitaries and criminal gangs has killed at least 220,000 people and displaced millions.